PSALMS 19:14 KJV "Let the words of my mouth, and the meditation of my heart, be acceptable in thy sight, O LORD, my strength,..."
11Moreover by them is thy servant warned: and in keeping of them there is great reward. 12Who can understand his errors? cleanse thou me from secret faults. 13Keep back thy servant also from presumptuous sins; let them not have dominion over me: then shall I be upright, and I shall be innocent from the great transgression. 14Let the words of my mouth, and the meditation of my heart, be acceptable in thy sight, O LORD, my strength, and my redeemer. 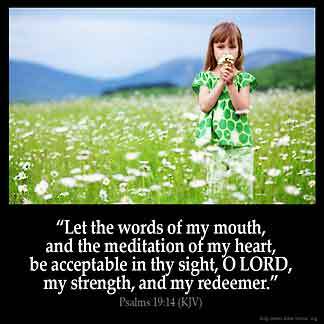 Let the words of my mouth, and the meditation of my heart, bee acceptable in thy sight, O Lord my strength, and my redeemer. Let the words of my mouth and the meditation of my heart Be acceptable in thy sight, O Jehovah, my rock, and my redeemer. Psalm 20 For the Chief Musician. A Psalm of David. Let the words of my mouth and the thoughts of my heart be pleasing in your eyes, O Lord, my strength and my salvation. Let the words of my mouth and the meditation of my heart be acceptable in thy sight, O Jehovah, my rock, and my redeemer. Let the words of my mouth and the meditation of my heart be acceptable in your sight, Yahweh, my rock, and my redeemer. For the Chief Musician. A Psalm by David. Let the sayings of my mouth, And the meditation of my heart, Be for a pleasing thing before Thee, O Jehovah, my rock, and my redeemer! (19:15) Let the words of my mouth and the meditation of my heart be acceptable before Thee, O LORD, my Rock, and my Redeemer. 19:14 Let - Having prayed that God would keep him from sinful actions, he now prays that God would govern, and sanctify his words and thoughts: and this was necessary to preserve him from presumptuous sins, which have their first rise in the thoughts. Redeemer - This expression seems to be added emphatically, and with special respect to Christ, to whom alone this word Goel can properly belong. If what we say is what think, if any man did not offend in words. the same is a matured christianIf we can allow the Holy Spirit to lead in our thought and talking life, God will be more glorhfied in our lives. we should watch out how we speak and what we think about because each word you say you will be judged. We should be concerned not only about what we do but also about what we say and think. It is one of the best Pray for any one who loves to Praise The Lord and Thank Him for what He has done for them in Life. What does '...words of my mouth... ' mean?